The Mertek Media Monitors, a Hungary-based media monitoring think tank, has released its second annual survey of the state of press freedom in Hungary. The survey is based on interviews conducted with media managers, journalists, and members of the general population. The results of the survey are interesting. 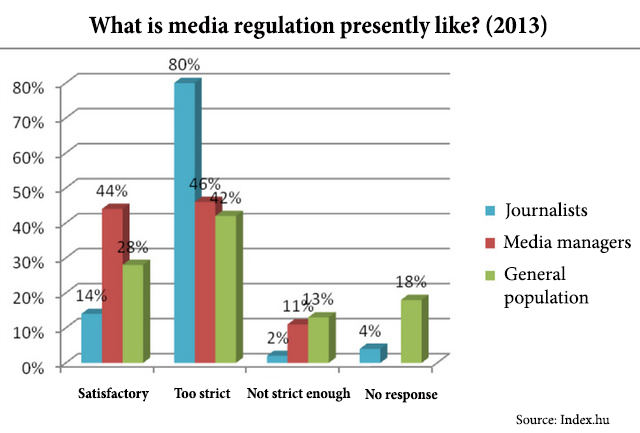 Whereas media company directors and the general population believe the situation with regard to press freedoms was better in 2013 than the previous year, journalists believed the situation to be far worse in 2013 than in 2012. Mertek interviewed 193 journalists. On a scale of one to ten journalists rated press freedom in Hungary 4.3 (versus 4.8 in 2012). 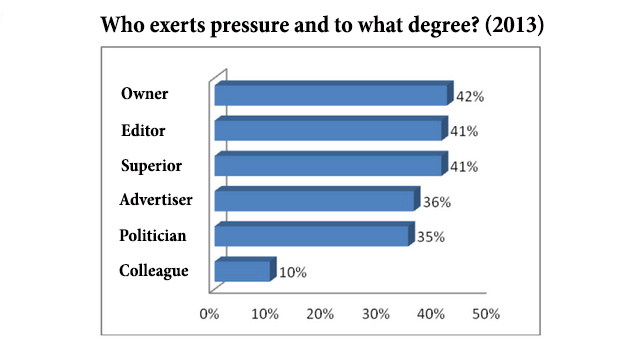 73% of journalists working in print media reported that they personally come under some form of pressure exerted by politicians. 34% reported that they practiced self-censorship, up from 22% in 2012. According to another survey conducted last year, 70% of journalists interviewed reported that they practiced self-censorship, 55 per cent said their employment depends on their political preferences, and 80 per cent claimed to be under some level of pressure when generating content.